As the speed of business increases, so does the frequency of last-minute changes to the schedules of contact centre agents. Proactively keeping agents informed when their schedule for the upcoming days has changed used to mean calling or emailing them, but now there is a better way. 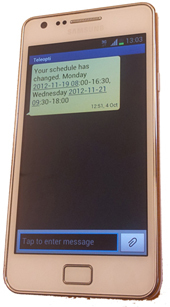 Teleopti WFM SMSLink is a feature that automatically sends significant schedule changes to agents’ mobiles through SMS (Short Message Service). When an agent’s shift has been significantly changed, such as new start or end times or a switch between a day off and a working shift, Teleopti WFM wokforce management solution generates an automatic message which is sent to the agent’s mobile through a local SMS gateway provider. The message includes full details about the date and new start and end times of the shift, ensuring that agents have all the information they need to be at work at the correct time. And since it is fully automatic it is not dependent on action from a supervisor, meaning schedule changes are automatically broadcasted every time and supervisors can focus on their work instead. Ensure your remote staff or home-workers stay up to date with schedule changes.